A. I wanted a whimsical winter wedding but with simplicity. I actually fell in love with the bridesmaid dresses in the "Cabernet" color and went from there. 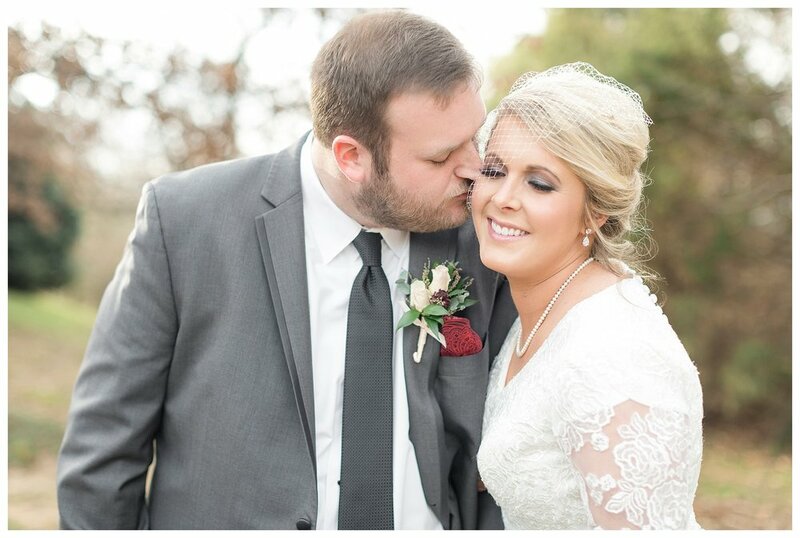 The blush/champagne colors went well with the deep burgundy so they became the colors of the wedding. The matte gold sequin touches came about when designing the possible table looks at Eventures with my coordinator, Karie Sutton. We were playing with different light colors that went with the burgundy and centerpiece and I fell in love with the sequins. Who doesn't love sequins!? A. The decor matched my taste and turned out exactly what I wanted. I loved the simplicity yet it was still a winter whimsical feeling! We chose Penguin Ed's because it's a place that we love to go eat at and we are huge fans of BBQ. The cakes came from Rick's Bakery (another one of our favorites). Kyle loves the Hogs plus our ties to the UofA pretty much decided that the grooms cake would be a Razorback. The grooms cake was one of his favorite flavors- red velvet. He also loves just a simple white cake so we made sure to use that as one of the layers in the 4 tier cake. I got to pick the other too and my favorite cake flavor is strawberry! So the biggest portion of the cake was strawberry and the last section was their apple spice cake (which is simply delicious and so flavorful!). The alcohol choices were each of our favorite kind of drink. We created koozies for our best day as party favors for everyone! The photo booth was a big hit with the guests! We were able to create the photo strip to incorporate our colors and theme. I chose to wear a bird cage veil instead of a long veil. I never pictured myself wearing a traditional veil and I absolutely love how the bird cage veil turned out with my dress and hair. It fit my style! A. I think that what made our wedding "ours" was that we had everything that we wanted and tweaked things along the way to make sure that it's what we would be happy with 20 years down the road! One of my favorite parts was my jewelry. I wore my late maternal grandmothers gold watch that my late grandfather bought her when she retired. My mom surprised me by having a jeweler get it working again along with a good cleaning. The pearl necklace that I wore was given to me for my 21st birthday by my paternal grandmother. The silver cake cutter that we used was from my parents wedding 34 years ago. A. I think the highlight of the day was Kyle's 94 year old "Aunt Speedy" dancing with one of the groomsmen on the dance floor. She had a blast out there! She definitely stole the show and many people are still talking about her dance moves!